I finally got my hands on a copy of the Annie’s Attic book, Learn To Do Bavarian Crochet that so many people have been talking about. It’s written by Jenny King and contains patterns for nine projects using the ‘stitch’. Actually, it’s a ‘stitch pattern’. It looked very familiar to me. I scouted online through my favorites til I found it! It’s Sarah London’s Wooleater Blanket. Further search revealed that, while the two patterns are similar, they are not the same. I find Sarah’s Wooleater Blanket to be an addictive phenomenon. Once I start, I can’t help but continue far into the night so I can see how the next row will look, and the next row, and the next one – and the next thing I know it’s 3 AM! You can see Sarah’s Blanket, instructions for making it, and links to pictures of all kinds of color combinations it’s been made in so you can grab your bin of orphan skeins and start making your own. The book has some benefits. It has those nine projects which include a pretty little vest, a cute scarf and cap, a runner, a basket, and a shawl in addition to a couple of afghans. Having these patterns presented visually shows me the flexibility of this stitch pattern. I find that it looks especially charming as a scarf, a look that would not have jumped to mind had I not seen it in this book. 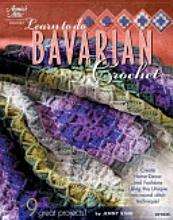 If you like the looks of the Bavarian crochet stitch pattern, I’d suggest you try both Sarah London’s method and the one in the book. Each has its appeal. The stitch pattern in the book is a bit fuller than Sarah’s – and I do like having those patterns available. The book is readily available through online vendors, so you can get a good deal on it now. I just finished the afghan and like you said the pattern stitch is very addictive. I just had to see what next color would look like when the row was finished. I used Simply Soft baby colors, varigated, yellow, blue, pink, lavendar & peach. Everyone who saw it wanted to know if it was for sale. NOT!!! I have both the book and Sarah’s instructions, but have yet to try either. I thought they were the same so I’m glad now that they are different. Now I can’t wait to try both. Of course that means something else will move down on the list. Ha not as if that’s the first time it’s happened! Ooo Wilma I bet that’s just beautiful! I would love to see a pic! Do you post on flickr?